A passive optical network (PON) is a good candidate for the infrastructure of next-generation IP-based wireless backhaul because it saves the network both fiber length and transceivers. For the fast processing of time-sensitive packets such as control and voice-over-IP data, two upstream wavelengths are evenly assigned to optical network units (ONUs) and efficiently managed so that real-time packets from each ONU are transmitted with a smaller cycle time compared with that of normal packets. 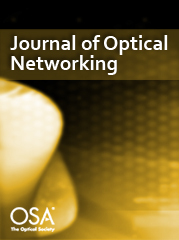 Algorithms of a two-upstream-wavelength PON (2W-PON) are proposed and the performance is analyzed. A prototype of a 2W-PON is implemented and the test results are provided.